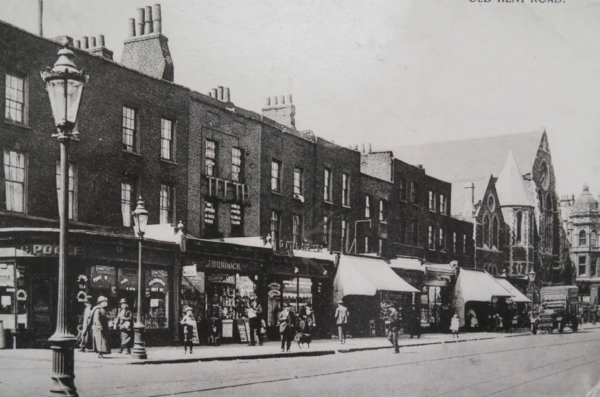 The history of Old Kent Road stretches back more than 2,000 years. It’s one of Britain’s oldest roads and its origins can be traced back to an ancient route once used by the Celts. Since Roman times, the road has been the primary route between London and the Kent coast. The Anglo-Saxons knew it as Watling Street; later generations knew it simply as the Kent Road and today it’s Old Kent Road. In the medieval era the road was famous as being a major part of the pilgrimage route to Canterbury. It was later immortalised by Geoffrey Chaucer in his collection of pilgrim stories, The Canterbury Tales. Victorian Londoners knew Old Kent Road as a place of industry; associated with the docks, the railway and the South Metropolitan Gasworks. In the late Victorian years, the street would secure its place in Cockney folklore with the 1890’s Music Hall song “Knocked ’em in the Old Kent Road” and in the 20th century it became better known still as the starting point for a million rounds of the board game, Monopoly. For most of its existence, Old Kent Road had been a rural thoroughfare which led in and out of London but wasn’t considered part of the metropolis. During this time, the only significant development had been a handful of coaching inns, catering to the needs of travellers. In the early 19th century, all this began to change: first with the building of the Grand Surrey Canal; then the establishment of the gasworks and later with the arrival of the railways. In the early 1800s, London had begun expanding rapidly; radiating out along its primary arterial roads. This included Kent Road (as it was then). Terraced houses, schools, churches, pubs, gardens and industry were built on farmland, either side of the road, and shops were subsequently built on the front gardens of the new town houses to form the high street. Some of this early development was rather grand and aimed at the “carriage owning” classes who could afford to commute into London. Local landowners, such as John Rolls (1735-81) had high aspirations for the area. This can be seen in the semi-detached villas in Glengall Road and the surviving terrace of housing at 541 to 553 Old Kent Road. However, the building of the Grand Surrey Canal, which reached Old Kent Road in 1807, ensured that the area would never be just a residential suburb. The canal didn’t spark an immediate boom in housing (as had been predicted) and until the late 1820s the canal relied mostly on market gardening for business. But, little by little, industry slowly began to take advantage of the link back to the Surrey Docks. These included timber yards and lime kilns, breweries, tanneries, whiting and mineral water works. 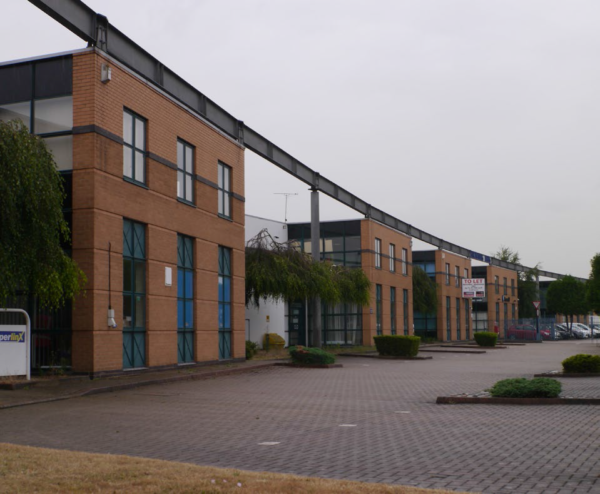 By the 20th century, a broader range of industry began to emerge, including the Edison Bell factory on Glengall Road which manufactured some of the earliest recorded music. The employment generated by burgeoning industry, eventually led to pressure on housing. The high aspirations of the estates were revised and housing in the area became smaller, more tightly packed and more densely occupied. By the 1890s, overcrowding had become a significant problem. This led Camberwell Borough to buy Leyton Square (one of the earlier aspirational developments) to use as a public park. The original buildings that fronted the square were demolished in the early 1950s but the park remains to this day. The industrialisation which followed the construction of the canal was bolstered by two other arrivals on Old Kent Road: the railway and the gasworks. 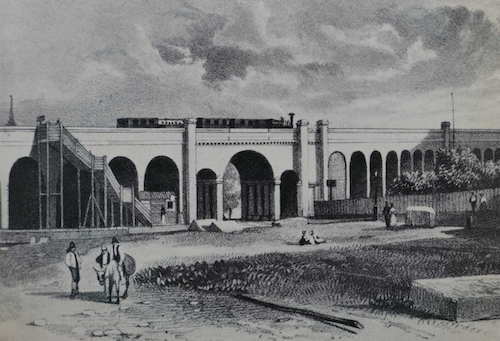 Part of the city’s first railway system, the 1830s viaducts built in south Bermondsey connected the suburbs to central London. In the 1840s, a new viaduct branched off west through the area behind Old Kent Road and terminated at the Bricklayers Arms. By the 1850s this had become a goods-only line and the Bricklayers Arms station a goods depot and carriage sidings. The Bermondsey railway and its viaducts largely defined the character of the area for the next 150 years. By the 1880s, urban development was encroaching on the railway land itself and by the end of the century urban terraces wholly encompassed the railways, interspersed with local industry and factories. 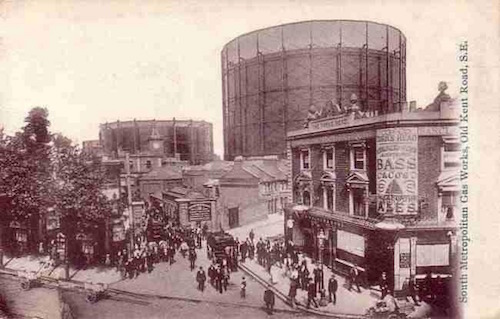 To this day, one of Old Kent Road’s most familiar landmarks is the gasholder behind Sandgate Street – a reminder of the area’s Victorian industry. There were once eight of them at the South Metropolitan Gasworks established in the 1830s. The company originally located its gasworks here to be close to the canal, which it used for transporting coal on its own fleet of barges. The gasworks grew steadily under Thomas Livesey and his son George. By 1900 the site covered 36 acres and contained a cricket ground, cycle track and allotments, as well as the gasholders. At the time, the gasworks were at the cutting edge of a new technology which would fundamentally change the domestic lives of ordinary people. George Livesey had a long association with the neighbourhood. He grew up in the Canal Grove cottages, established Camberwell’s first public library on Old Kent Road (later the Livesey Museum) and served as a Sunday school teacher in Christ Church. The gasworks site is now occupied by Southwark’s Integrated Waste Management Facility and the gasholder is a listed building set to remain a landmark for many years to come. Yet, while this grand Victorian relic survives, much of what would have been familiar to previous generations was destroyed during the Second World War. As the site of so much industry and infrastructure, the area was high on the list of targets for German bombing raids, and by 1945 large parts of Old Kent Road had been left in ruins. After the war, town planners set out to separate housing from industry. Many of the damaged streets and old buildings were replaced either with new council housing estates such as the Tustin (built on the site of terraced housing in the late 60s) or with new industrial developments; particularly storage and distribution centres. Post-war planning also saw the creation of the Bricklayers Arms junction and flyover and Burgess Park. By the 70s the railway had gone into decline and the railway land was redeveloped. The train depot in Bermondsey became the Bermondsey Trading Estate and the redevelopment of other rail land helped to remove some of the physical barriers that had separated Bermondsey, Peckham and Walworth for more than a century. By this time, the canal was also redundant and it was eventually filled-in, including the Nye’s Wharf and Park Road basins. The traces of the canal can still be seen here and there, including in the retaining wall to the tow path at the rear of the Asda car park. In the late 70s and early 80s, more housing and factories made way for retail warehouses as well as for the new Brimmington Park. The Mandela Way Industrial Estate, which opened in 1984, provided wide, single-storey sheds for modern industry. In the 1990s, functional out-of-town retail warehouse units (with large areas for parking) were built for Tesco and other stores in the Southernwood Retail Park. This famous mosaic on Old Kent Road depicts medieval pilgrims on their way to Canterbury. 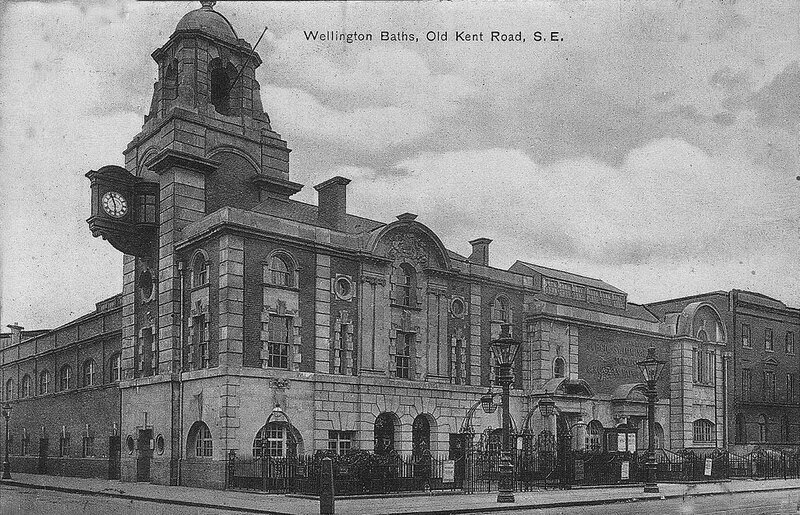 The Wellington Baths on the corner of Old Kent Road and Marlborough Grove were destroyed during the Blitz. 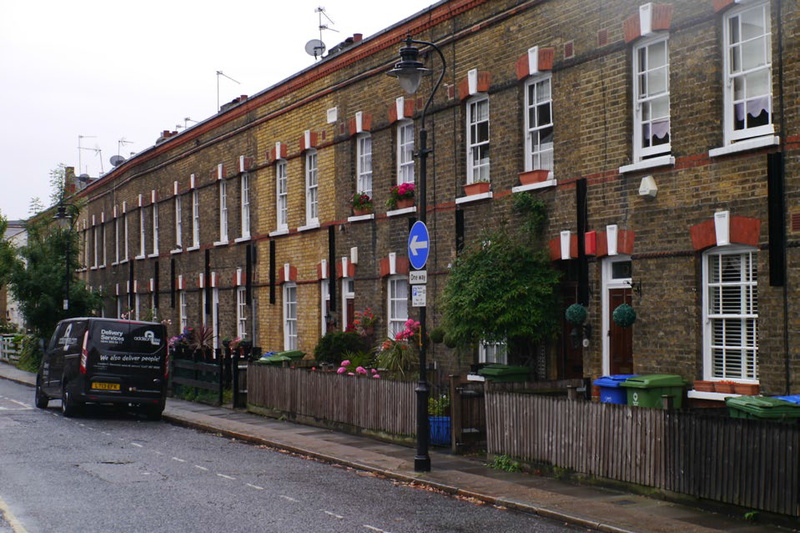 Pages Walk has the kind of terraced housing once common around Old Kent Road. Opened in 1887, the R Whites factory produced soft drinks for almost a century. It was demolished in the 1970s and a football pitch occupies the site today. John Beesley runs a professional black taxi fleet in Ormside Street. It's a 300-year-old profession and John is proud to be a part of it. The industry is changing though and John thinks this site might not be right for the future. This famous mosaic in Old Kent Road depicts medieval pilgrims on their way to Canterbury. 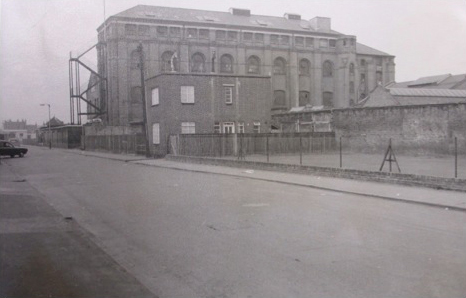 Opened in 1887, the R Whites factory produced ginger beer, lemonade and other fizzy drinks for almost a century. It was demolished in the 1970s. A football pitch occupies the site today.